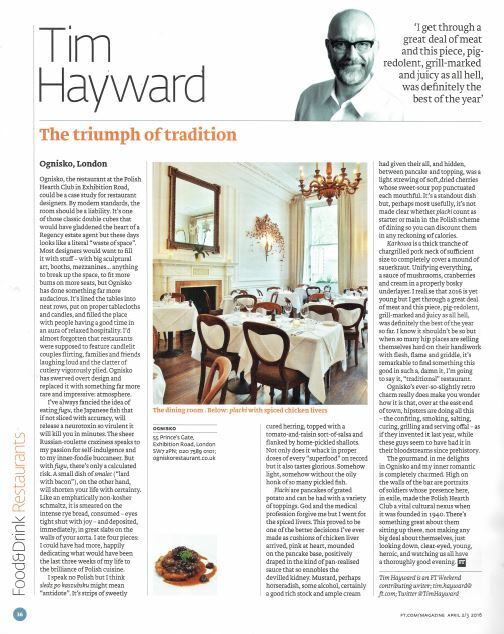 Great review by Tim Hayward from FT Weekend – thank you! I speak no Polish but I think sledz po kaszubsku might mean “antidote”. It’s strips of sweetly cured herring, topped with a tomato-and-raisin sort-of-salsa and flanked by home-pickled shallots. Not only does it whack in proper doses of every “superfood” on record but it also tastes glorious. Somehow light, somehow without the oily honk of so many pickled fish. Placki are pancakes of grated potato and can be had with a variety of toppings. God and the medical profession forgive me but I went for the spiced livers. This proved to be one of the better decisions I’ve ever made as cushions of chicken liver arrived, pink at heart, mounded on the pancake base, positively draped in the kind of pan-realised sauce that so ennobles the devilled kidney. Mustard, perhaps horseradish, some alcohol, certainly a good rich stock and ample cream had given their all, and hidden, between pancake and topping, was a light strewing of soft, dried cherries whose sweet-sour pop punctuated each mouthful. It’s a standout dish but, perhaps most usefully, it’s not made clear whether placki count as starter or main in the Polish scheme of dining so you can discount them in any reckoning of calories.